Hey there Main Streeters. We were going to get back to the end of Act 2 today. I had it all written out. And then yesterday, Disney Parks announced that in January, Aladdin: The Musical Spectacular would be closing at the Hyperion Theatre to make way for Frozen: The Musical. And everyone panicked. Don’t lie – they did. I watched it happen in multiple groups on Facebook, including in TMSM Fan Nation. So I’m hoping that I can ease your panic just a tiny bit by explaining this process to you. Because it’s actually a natural step in Mouse to Marquee histories. Broadway shows go through many many steps and iterations before they premiere on The Great White Way. They don’t just open on Broadway. There are workshops where things are tried and tweaked, actors can be replaced. Then, even before the Broadway premiere, there will be an out of town tryout. This is usually the first time the show is performed for general audiences, and they get audience feedback. Scenes will be rewritten, songs cut or added, and again, you may recast actors. But Disney Theatrical usually takes one more step than most Broadway shows, because unlike any other Broadway Theatrical Production Company Disney has thousands of people to make up a live audience walk through park gates around the globe on a daily basis. It is not unusual for Disney Parks to be the first place new productions from Disney Theatrical dip their toes in the water. They’re never the entire show planned for Broadway, and they’re rarely exactly the same as what premieres on the Broadway stage years later. But it’s a chance for Disney to test out the new technical effects they want on Broadway (like a flying carpet or castle full of enchanted objects). Beauty and the Beast Live on Stage premiered at MGM and later at Disneyland before coming to Broadway in 1994. The Legend of the Lion King played at the Magic Kingdom before The Lion King opened on Broadway in 1997. Tarzan Rocks! played at Disney’s Animal Kingdom 7 years prior to the 2006 Broadway premiere of Tarzan on Broadway. Voyage to the Little Mermaid still plays in Hollywood Studios and premiered well in advance of the 2008 Broadway premiere. Aladdin – The Musical Spectacular played at Disney’s California Adventure for 11 years before the Broadway production premiered in 2014. 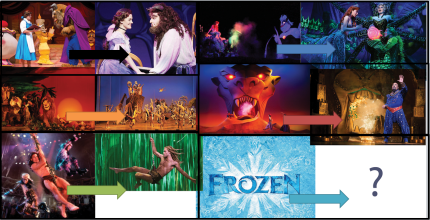 Disney Theatrical has already announced plans for Frozen to be the next Broadway show. So it’s only natural that Frozen The Musical is coming to Disneyland in advance of it. There are many technical aspects that Disney undoubtedly needs to figure out in advance of going to Broadway, like non-human characters such as Olaf and Sven, and Elsa’s transformation during “Let it Go”. So this is not the sign that Frozen is coming to take over everything you hold dear as Disneyland and Walt Disney World slowly transforms into Arendelle. This is Disney doing what Disney always does. Trying things out in theme parks so they can deliver the quality entertainment they’re known for on Broadway. TMSM is thrilled to give it’s readers a chance to experience it’s new series “From Mouse to Marquee” written by Addie Clark. If you have missed out on any segments of “Mouse to Marquee” you can find them all here in our archives!